Privacy may not be the first word that comes to mind when you’re designing or reimagining your retail storefront. Retailers should create an atmosphere of openness and accessibility, with all of their display merchandise clearly visible, right? Well, using privacy window films, especially those that provide a frosted effect, on your storefront window can actually be a great way to entice customers by only giving them a taste of what they’ll find inside. Once you’ve drawn them in with some clever retail window display ideas, the effect of the frosted window films can provide for your customers a sense of privacy and exclusivity while they shop. Creating an enjoyable shopping experience is key to closing sales and driving word-of-mouth advertising for your business. By canceling the distractions of the outside world, you free up your customers to focus exclusively on the experience of shopping in your store. Privacy film is most commonly found in office settings, but it also presents an opportunity for retailers to pique the interest of passersby and draw them inside. These films can even be used to create optical illusions in storefront window displays, because the opacity of the glass changes when viewed from different angles. With the right film in the right display, you can create a sense of mystery and exclusivity for your store without being unwelcoming. If you can provide only an alluring glimpse of your merchandise, customers will have to enter to find out what else you have to offer. 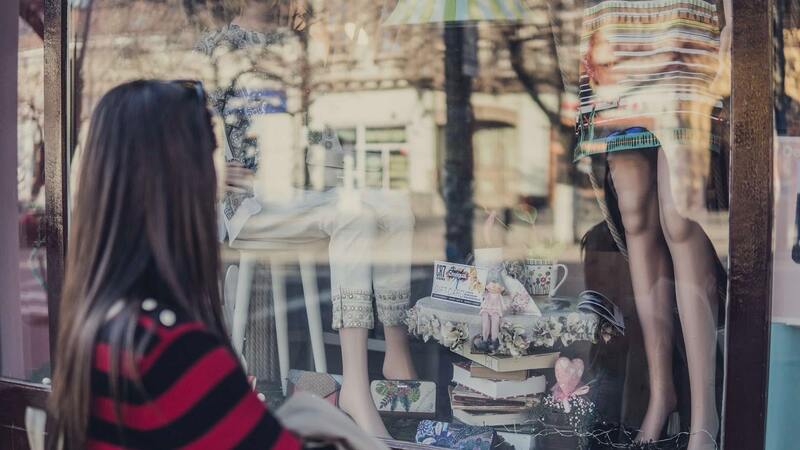 Inventive window displays can help your retail shop stand out from the sea of competitors constantly fighting for their attention. Including creative use of frosted window film in your storefront can make the difference between your target customer stopping in their tracks or walking right on by. Frosted window films can also be used in a more traditional capacity to give you and your customers privacy where necessary. If you’ve got fitting rooms or other private areas in the back of your store, you can provide your customers with an added sense of security without sacrificing your overall design aesthetic with frosted window glass. This applies to you and your employees as well. If your store’s employee offices are surrounded by interior glass, privacy film can help keep the space private and secure without fully separating it from the rest of the store. This layout blurs the barrier between management and customer while providing a sense of comfortable seclusion for both. Attracting customers is one thing, but once a customer enters your store you want to provide them with the best shopping experience possible. If you use frosted window film on your storefront windows you can create an atmosphere in which the outside world melts away as soon as the customer steps inside, allowing them to focus on what’s right in front of them without distraction. Make it so time stands still while your shoppers peruse your merchandise at their leisure. No rush, no interruptions, only purchasing time.